By reverse engineering behavioral addiction, Professor Alter explains how we can harness addictive products for the good ... and how we can mitigate their most damaging effects on our well-being, and the health and happiness of our children. 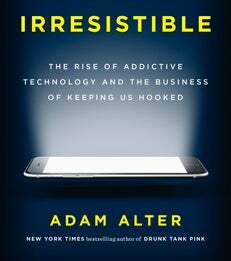 In his latest book, Professor Adam Alter tracks the rise of behavioral addiction, and explains why so many of today's products are irresistible. Though these miraculous products melt the miles that separate people across the globe, their extraordinary and sometimes damaging magnetism is no accident. The companies that design these products tweak them over time until they become almost impossible to resist. By reverse engineering behavioral addiction, Professor Alter explains how we can harness addictive products for the good—to improve how we communicate with each other, spend and save our money, and set boundaries between work and play—and how we can mitigate their most damaging effects on our well-being, and the health and happiness of our children.